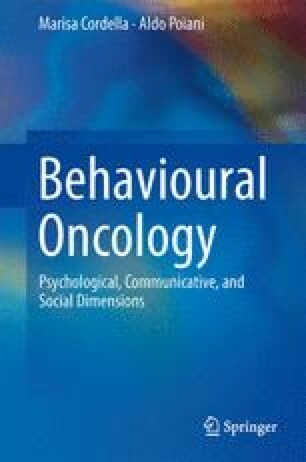 Although in the previous chapters we have mainly emphasised the individual aspects of behavioural oncology, we also made some mention of the social context of the cancer experience, in the form of social interactions being either a source of stress or an aid in coping with stress ( Chaps. 2 and 3) and how those effects may alter the activity of the immune system ( Chap. 2). We also indicated how social support is particularly important to cancer patients at the emotional level, although it can often be relevant also through the provision of information and financial and/or physical help. When social support fails, distress and even depression are more likely to develop in cancer patients ( Chap. 3). A very common source of social support is provided by members of the direct family and also by friends, but, for many cancer patients, members of a spiritual/religious group may also be of importance ( Chap. 4). Sociality, however, is likely to have an even more complex relationship with health and disease than what we have been able to describe so far. For instance, there is an issue of causality between health and sociality that should be specifically untangled: Is it the lack of social support that results in the worsening of health or is it a worsening of health that leads to withdrawal of social support from specific others? Or perhaps people who are ill are simply incapable of nurturing social interactions in a sustainable manner?